The 2018 Introduction to Fly Fishing Class schedule has been set. 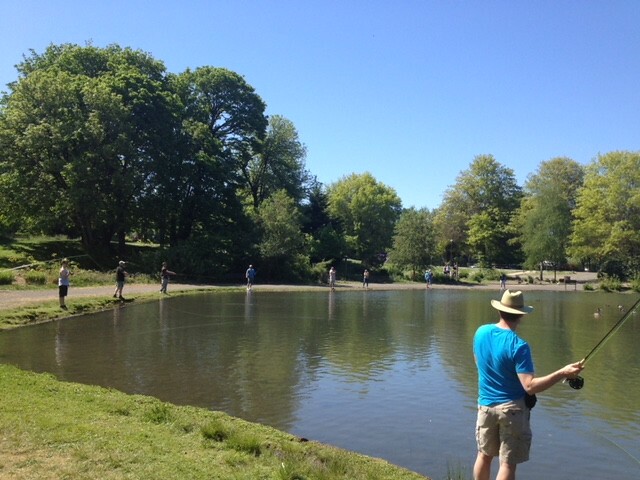 Our classes are designed for individuals who wish to learn the basics of fly fishing. Inspired by the original casting classes held by Les Eichorn, Bob Guard and Mel Krieger our 6 hour class will have interested anglers on their way to fly casting mastery. Our classes are divided into two sessions. The first two hour session is a “in the shop” session where terminology, equipment, knots, entomology, fly fishing tactics and where to find fish are covered. The second four hour session is a on the water casting instruction where students learn three fundamental casts. All equipment is provided, a textbook is included and we maintain a one instructor to 5 student ratio. Cost is $55, all equipment is provided, sign up at the shop or call 541-342-7005 to sign up. Class Schedule for 2018 : Classes on two dates are Friday evening (6-8PM) at the shop and Saturday at Alton Baker Park (9am-1pm). Classes on three dates are Wednesday (shop 6-8pm), Thursday, and Friday evenings Alton Baker Park (6-8pm). This entry was posted in Oregon Fly Fishing Clubs and Events, Oregon Fly Fishing Tips. Bookmark the permalink.